On average, people consult their doctor five times a year meaning there is huge opportunity to deliver this low cost intervention on a large scale. Tackling obesity by offering the opportunity to attend a weight loss programme during a routine consultation is effective, welcomed by patients and takes 30 seconds of physicians’ time, according to a new randomised trial of over 1800 people published in The Lancet. The trial, led by the University of Oxford, included 137 GPs in England and 1882 people attending a consultation unrelated to weight loss. At the end of the consultation, participants were randomly allocated to receive one of two 30-second interventions. Half (referral group, 940) were offered a 12-week weight management programme available for free on the NHS. If the referral was accepted, the GP ensured the first appointment was made for the participant and offered follow up. The typical conversation with the GP began with “While you’re here, I just wanted to talk about your weight…”. Over three quarters (77%; 722/940) of those offered the intervention agreed to take part in the weight management programme and 40% (379/940) attended. The average weight at the start of the trial was approximately 105kg for men, and 93kg for women. People in the referral group lost on average 1.43kg more weight than those in the control group (2.43kg average weight loss in the referral group, compared to 1.04kg in the control group). Furthermore, a quarter of participants in the referral group had lost at least 5% of their body weight after a year, and 12% had lost at least 10% - double the rate of the control group. Importantly, the majority of people (81%, 1530/1882) across both groups found the intervention appropriate and helpful, while only 4/1882 (0.2%) found it inappropriate and unhelpful. Over the 12 months of the trial, a similar proportion of people in both groups had taken some action to lose weight, but approximately five times more people in the referral group had taken effective action. The study did not directly assess participants’ desire, intention or confidence to achieve weight loss but the research team excluded people who were already taking part in weight loss programmes, suggesting most people in the trial had low motivation to lose weight. The study took place across the south of England and the participants were slightly more affluent on average than England as a whole. The results are likely generalizable to other countries where similar weight loss programmes are offered free of charge (eg, UK, Australia, Germany). Estimating the cost of the intervention, the authors say that the 30 seconds of GPs’ time costs approximately £1.45 and the 12-week behavioural programme costs about £50. Booking the participant’s place on the weight loss programme could be done by administrative staff at GP practices, such as receptionists at a cost of approximately £0.76 for the 2 minutes it takes to find a convenient time and transfer voucher details. 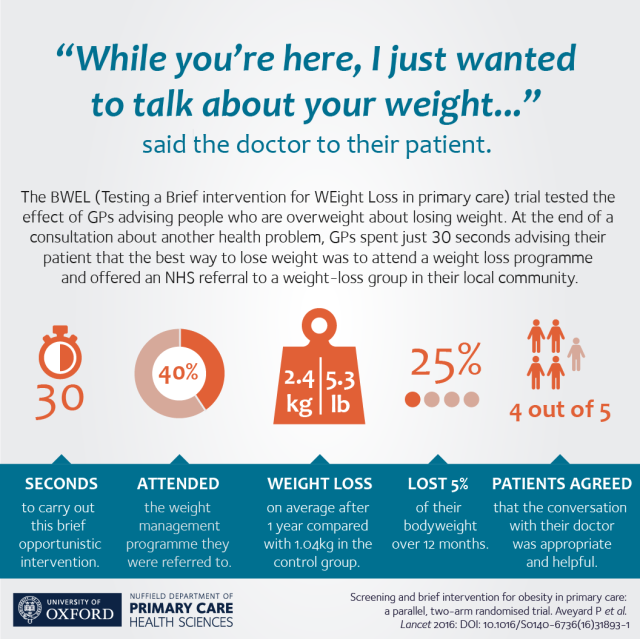 Given 40% attended the weight loss programme, each time a GP intervenes in this way would cost the NHS about £22 – equivalent to a cost per kg of £16 over 12 months, which is much lower than other available interventions for obesity, for instance prescription pharmaceuticals. Screening and brief intervention for obesity in primary care: a parallel, two-arm, randomised trial. Aveyard Pa, Lewis A, Hood K, Christian-Brown A, Adab P, Begh R, Jolly K, Daley A, Farley A, Lycett D, Nickless A, Yu L-M, Retat L, Webber L, Pimpin L, Jebb SA. Download summary (pdf): Explaining the research study and what it found.